TORONTO, ONTARIO, January 14, 2018 – The 2018 Toyota Prius Prime goes the distance – offering futuristic styling, advanced technology and an ultra-efficient power train that lets drivers travel more than 1,000 kilometres on a single tank of gas with a full battery charge. And Canadians from coast to coast will soon be able to experience how Prius Prime does this with absolutely no sacrifices to comfort or amenities, as Toyota makes Prius Prime available through its entire network of Toyota Dealers across the country. 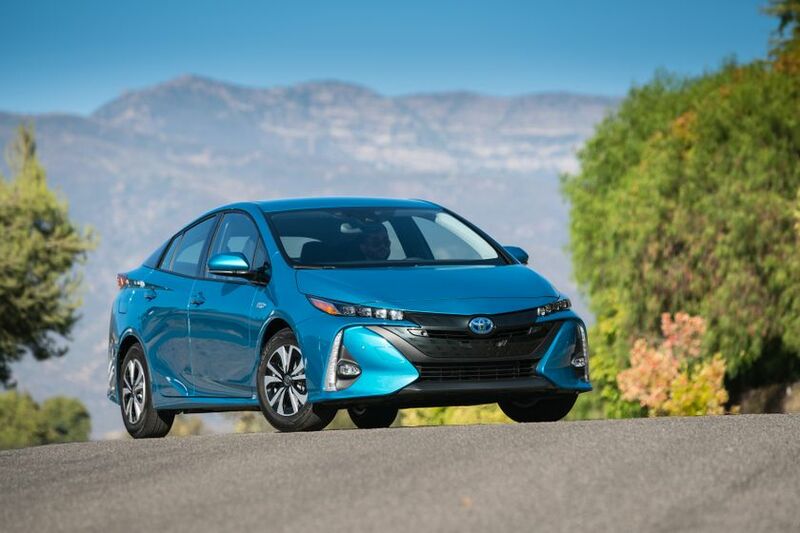 With over 700 sales in less than seven months in Toyota’s initial test market, Quebeckers embraced Prius Prime’s total package of worry-free efficiency and fun driving. Now, the impending introduction of Prius Prime to the national market will give all Canadians the opportunity to experience the future of advanced motoring, today – and move Toyota another step closer to its commitment to decarbonize the automobile, as outlined in the company’s 2050 Environmental Challenge. When it launched, the Toyota Prius Prime was crowned the World Green Car at the 2017 New York International Auto Show, and established itself as the most fuel-efficient plug-in vehicle on the road in Canada – with astonishing city/highway combined fuel efficiency of just 1.8 litre-equivalent / 100km with a full battery charge. In real world terms, this means Canadians could drive the Toyota Prius Prime from Vancouver to Calgary… from Saskatoon to Winnipeg… from Toronto to Quebec City… or the length of the TransCanada Highway on Newfoundland – from Channel-Port aux Basques to St. John’s… in comfort and style, and all without the need to stop to refill or recharge. What’s more, the Prius Prime can also be operated for up to 40km in pure Electric Vehicle mode – meaning that for many Canadians, they will be able to accomplish the majority of their daily driving journeys without using a single drop of gasoline. And when it’s time to recharge, Prius Prime enjoys the fastest charging time in the market. The body is sculpted with purpose. Enhanced with numerous aerodynamic features – including an active front grille shutter that closes at higher speeds – the Prius Prime slips through the atmosphere with minimal drag. This not only contributes to Prius Prime’s remarkable efficiency – it also makes for a smoother, quieter, more comfortable ride. The advanced styling includes Quad-LED projector headlights, LED daytime running lights, and LED taillights. Slip inside, and enjoy a spacious cabin that holds four adults in comfort, exhibiting modern design and premium materials throughout. Thoughtful interior touches delight the senses while powerful yet easy-to-use technologies enhance every trip with convenience and innovative thinking. The front seats are heated and feature deep bolsters for body-hugging comfort, while the rear seats feature a 60/40 split folding system to maximize cargo space and versatility. The heated, synthetic leather-clad steering wheel adds a welcome touch of comfort on cold winter drives. Dual 4.2” multi-information displays operated from the steering wheel provide the driver with essential information at a glance, while an ECO drive monitor helps drivers maximize their fuel efficiency. Premium amenities offered as standard include the Smart Key System with Push Button Start, driver door handle with touch sensor unlocking/locking function, power windows with auto up/down function on all windows, air conditioning enhanced with automatic temperature control, three 12V DC power connections for portable electronics, and more. Performance is also advanced, and engaging. A new hybrid system design boasts Toyota’s first use of a dual motor-generator drive system to boost acceleration for a more exhilarating driving experience. At the heart of Prius Prime’s hybrid system, a Atkinson cycle four-cylinder engine achieves ground-breaking thermal efficiency of more than 40 percent. A double wishbone rear suspension, electric power steering, a rigid body design, and other enhancements contribute to Prius Prime’s responsive handling and smooth ride quality. As a Toyota, the 2018 Prius Prime is also impressively equipped with active and passive safety systems. Headlining these is Toyota Safety Sense P – a bundle of advanced safety systems including Pre-Collisions System with Pedestrian Detection function, featuring forward collision warning and automatic emergency braking… Lane Departure Alert with Steering Assist function… Automatic High Beams… and full speed Dynamic Radar Cruise Control. Other features include the six active technologies of the Toyota Star Safety System, eight standard airbags, active front headrests with whiplash protection, a backup camera, direct tire pressure monitoring system, and more. The 2018 Toyota Prius Prime (starting MSRP $32,990 before any provincial rebates for PHEV vehicles*) features a 7” Display Audio System with SIRI Eyes Free, navigation, Bluetooth connectivity, advanced voice recognition, Gracenote connectivity, six speakers, and more. Other features include fabric seat coverings, adjustable driver’s seat, dual vanity mirrors, plenty of in-cabin storage, map lamps, digital clock, and more. New for the 2018 model year, the 2018 Toyota Prius Prime with Upgrade Package (starting MSRP $35,445 before any provincial rebates for PHEV vehicles*) is a new offering for the 2018 model year. This model enhances the audio system with a larger, 11.6” HD multimedia display. Other upgrades include a front passenger door handle and rear hatch handle with touch sensor unlocking/locking function, the Qi wireless charging system for compatible personal electronics, Softex leather seating, a power-adjustable driver’s seat, rain sensing wipers, and LED fog lamps.